We had the same problems with the allowed memory size. This post helped us very much! We now filter on manufacturer, and everything works fine. Any follow up on how well the edit/update and import went regarding the topics you listed at the end of your post? Kyle – I do have some updates and have been meaning to post them. I will do a full post but here are the highlights. 3. Complex Products – Not Possible, I am working with the Magento Core team on an Enterprise project and they let me know its not currently possible. I am considering writing a catalog extension with a former Magento Architect but nothing exists today that I am aware of. 5. Re-index – I am afraid to try this, especially the catalog search index (it took me a long time to get it to finish in the first place) – My updates are showing in search results. Did you write an extension to import complex products? I need an import solution that handles grouped products and it’s associated simple products. > You should try MAGMI it is simple and faster ! Thanks for sharing your experiences here, it’s useful, and if i can be also, it’s a pleasure ! Using this method we can export 16 k products in to it. Although it is very difficult to find each and every product details. it takes lot of time in doing it so .. If export the file and edit the manufacturers for each product, will this fill in the “name” description for each product so that it is displayed with the product description on the website. Sorry if I am not clear. I am no developer and I don'[t know all of the terms to use. Our site http://www.myfatpig.com has 30,000 products on it and the manufacturer will not show up in the title for any products. For instance, right now when you visit the site, our homepage products displayed may say 19″ LED Monitor. But we want the manufacturer displayed in front of that title. We need this done for all of our products. Is there an easy way? Is that what this post is referring to? As of now we are having 30k products. when we import the data, refreshing the reindex took more time. how can i reduce reindexing time? can anyone help me.. This is working on Magento 1.5 too. 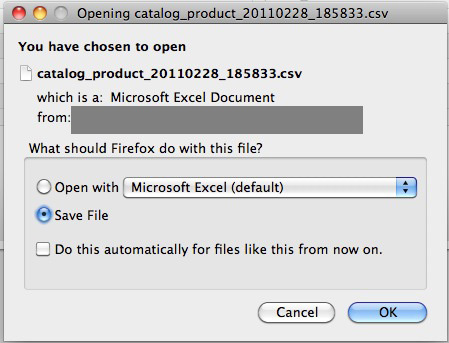 Just you need to add a column in csv ‘has_options’ & set the value to ‘1’ for the products which are having custom options. 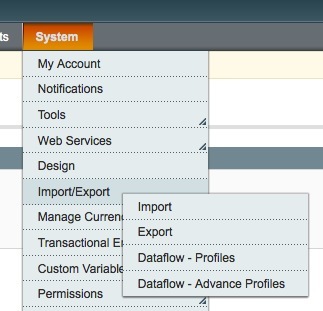 hi im using magento 1.4. i see the field has_options in the import file. could you please how should i be specifying custom options in the import file?